Last week, I went to see "The Perks of Being a Wallflower" expecting to be entertained as much as I was reading the book because, after all, the writer of the movie screenplay was none other than Stephen Chbosky himself. Later on, I found out that he was also the director! Needless to say, it was such an amazing experience being able to witness on the big screen the same moments that I loved from the novel. The story was told in the most beautiful way. Having said that, I am simply left in awe of Chbosky's talent. 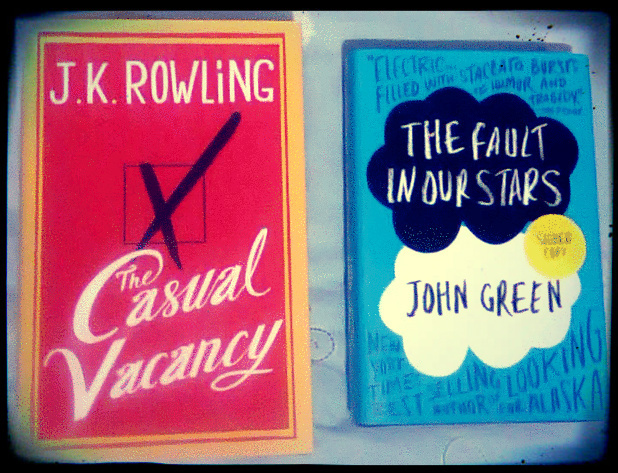 Bought Queen Jo Rowling's new book, "The Casual Vacancy," last payday Friday! Meanwhile, I was able to get a signed copy of John Green's latest release, "The Fault In Our Stars," at 20% off thanks to Fully Booked - Gateway's sale! Meanwhile, in the music scene... If you haven't head it yet, listen to Rihanna's new single "Diamonds"! Lastly, if you're a fan of reality singing competitions, I suggest you get into the new season of The X Factor! Demi Lovato & Britney Spears are really great additions to the panel and it's almost the Judges' Homes round so it's gonna get exciting! Plus, the talents this year are really amazing from what I've heard thus far! Just look at these little girls singing it out!